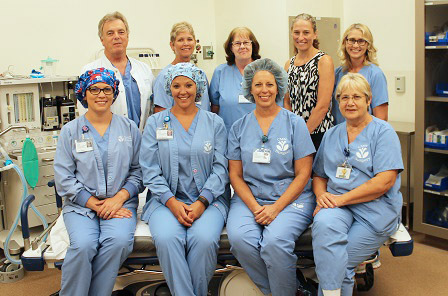 OR staff include (back row, left to right): Mike Stech; Renae Bruna; Phyllis Craig; Dr. Cheryl Rice; Janet Wassenberg; (front row, left to right): Kylie Carlson; Ashley Swearingen; Cindy Voet; Mary Lou Walter. Community Memorial Healthcare (CMH)offers a wide range of Surgical Services, including general surgery, endoscopy, urology, ophthalmology, obstetrics, orthopedics, ear, nose and throat, podiatry, and pain management services. Post anesthesia care unit (PACU) services are also a part of the Surgical Department. Our modern operating rooms are available 24 hours a day to provide care for both scheduled and emergency cases. The operating room (OR) crew at CMH is comprised of a variety of professionals with many years of experience in the operating room. Our surgery nurses are Advanced Cardiac Life Support certified. Several nurses have their national Operating Room Nurse Certification and some are Trauma Nurse Certified. Some are members of the Association of Peri-Operative Registered Nurses. They learn the latest techniques and patient safety issues through online educational sites and by attending local and national conferences. The number one responsibility of the OR team is to be the patient's advocate, especially concerning areas of safety and infection control. Surgeons at CMH are assisted by members of the OR team during all procedures by circulating and scrubbing. The team also evaluates patients prior to the case, assists anesthesia during inductions, and monitors the patient during recovery in either the post surgery or post endo rooms. The OR staff is responsible for scheduling, and for ensuring that all necessary supplies and equipment are available for procedures being done. The Central Service Technician assists by cleaning, processing and sterilizing instruments and scopes following national standards. They also clean and sterilize instruments for other hospital departments and physician clinics. Anesthesia services are provided by our Certified Registered Nurse Anesthetists. They provide care 24 hours a day. Anesthesia services include all surgeries and scopes, obstetric anesthesia, epidural steroid injections for pain management and emergencies in the ER. Through the efforts of our CMH Foundation, our facility owns state-of-the-art surgical equipment, equal to or surpassing other operating rooms. We are continually reviewing our equipment needs. • Endoscopic procedures including bronchoscopies, esophagogastroduodenoscopy (EGD) & colonoscopies. • General surgical procedures include hernia repairs, bowel resections and numerous laparoscopic procedures, e.g. cholecystectomy, appendectomy, colon resections, and hernia repairs. Other surgeries are breast biopsies, mastectomies, lumpectomies, skin lesion removal, both cancerous and non-cancerous, and skin grafts. • Urological procedures including transurethral resection of the prostate and cystoscopy for bladder tumor excision. • Gynecological procedures including laparoscopic or abdominal hysterectomy, tubal ligation, and C-Section. • Orthopedic procedures including knee and shoulder arthroscopy, rotator cuff repair, carpal tunnel and trigger finger releases and other procedures on the extremities. • ENT procedures including ear tube placement, tonsillectomy and adenoidectomy (T & A), nasal surgeries. • Podiatry procedures including bunion excision and repair and other surgeries on the feet.